Sometimes simple is best. Actually around here simple is pretty much always in season, no matter what time of year. Do you own a cast iron skillet? I hope the answer is yes. If not, you kinda need one like now. Cast Iron Skillet Grilled Cheese Sandwiches have become my go-to meal. So why cast iron skillet you might ask? The secret to the best grilled cheese is having a super hot surface that conducts heat really well. That’s exactly what a cast iron skillet does. It’s a thick, heavy, inexpensive pan that is indispensable in the kitchen. It’s a work horse whose benefits are worth the little bit of extra loving you need to give it. A cast iron skillet will last a lifetime if you season it properly & give it a little TLC. Here are a few posts to help you with that. Have fun with your cheese selections. In these sandwiches I used Asiago with rosemary & medium cheddar slices. Using pre-sliced cheese is very easy & a time saver, but most of the higher quality cheeses are obviously in wedges, rounds & blocks. If hand trimming then be sure to cut each slice no thicker than 1/4 inch ~ so it melts quickly & completely. Enjoy 1/2 a sandwich for a mini-meal & a full one for lunch or dinner. No matter how you slice it…..you will no doubt love this crispy, buttery & gooey cheesy sandwich. You can purchase a cast iron skillet here & The New Cast Iron Skillet Cookbook too! Totally drooling over here at 6am 🙂 Looks great! I love great food that is easy to prepare! I can’t wait to try this! Love grilled cheese and a cast iron is perfect for them! I lovvvvve my cast iron skillet! And thanks for including a link to my grilled cheese! Isn’t it the BEST?! Your GC looks AMAZING!! “Around here simple is pretty much always in season.” My house, too! Nothing better than a classic grilled cheese. 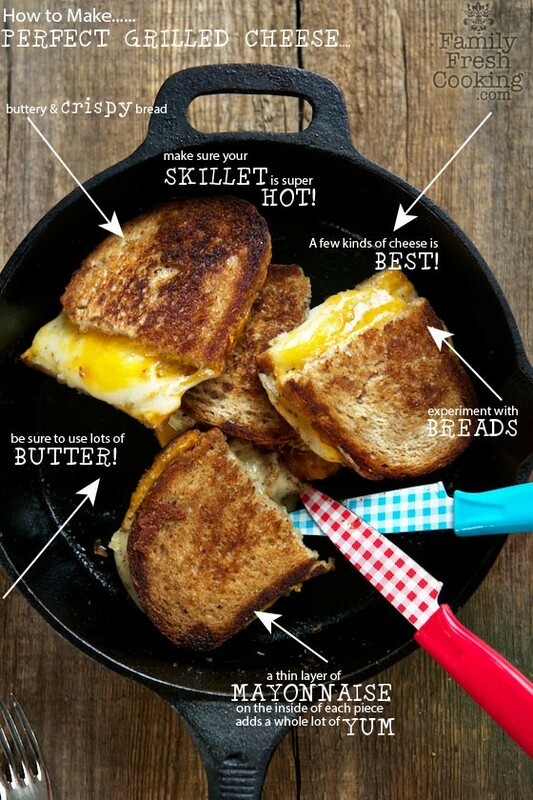 We always love a good grilled cheese sandwich in my home, so great tips to remember! This needs to be my lunch today, absolutely awesome! Wow, thanks for sharing my recipe! I need to add some cast iron to my collection! I could dig in right now! There’s always a good time for a simple recipe. I love melted cheese, so delicious with a chrispy bread. Wow this has got my attention. I have a cast iron skillet and I have the ingredients for grilled cheese. Dinner solved!! Cheese perfection, just what I want for lunch. Pinned! Your grilled cheese looks awesome. Thanks for linking to my post as well! Of course, anytime 🙂 Your grilled cheese looks amazing! Love using my cast iron for grilled cheese. In our house we are partial to fancy grilled cheese combinations that include any type of pesto, a couple varieties of cheese, sautéed greens, and mushrooms, or caramelized onions. Nothing beats a grilled cheese made this way! Awesome! It seriously is the best mountain food…especially after an active day! While I like your blog, its Very difficult to read on the go. The pop ups and banners take up most of the screen on my phone and tablet. On the computer its fine, but not always by my computer. Right now “airwick” and “blog her” are competing for the top of my screen and ” staples” and “AT&T” for the bottom. Add in 2 pop ups and I have been able to read very little before becoming frustrated. Is this happening to anyone else or is it just my service? BTW love grilled cheese, never thought to use my cast iron pan. Will have to try soon ! Thank you for letting me know this Julie & your thoughts are noted. It’s a fine balance to be able to provide excellent content & at the same time earn a living for all of my efforts. My wish is for one day to have a much “cleaner” space without the pop ups. In the mean time I really hope you enjoy your grilled cheese! Your grilled cheese looks amazing! I bet the crunch is perfect. Your grilled cheese sandwich looks yummy! I always use a regular skillet to make grilled cheese sandwiches. I will try to use a cast iron skillet to make grilled cheese with it. I bet it will come out delicious. Grilled Cheeses are so wonderful anytime! I love my cast iron pans. You have made me hungry!